With these all you need to change is the cylinder itself not the latching mechanism. 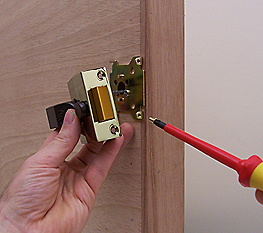 To get to the cylinder you'll need to remove the latch. With more modern latches this is held in place with retaining screws on the side of the door. Un screw these then slide the latch slightly to one side so it disengages from the latch plate. 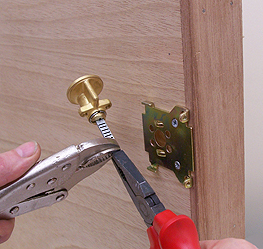 On older locks the latch simply screws onto the back of the door and doesn't engage with a latch plate. It will just come away when the screws are removed. You don't need to remove the latch plate, but you'll find the barrel is secured to it with two long bolts on either side of the connecting bar. Unscrew these and the cylinder(the bit that the key fits into)should slide out from the outside. The cylinder tends to be a standard size but if in doubt take it to your nearest locksmith/ hardware shop to get a replacement which will come with a set of new keys. Putting the new cylinder back is simply the reverse of the above. 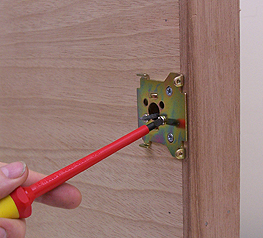 NB you may however have to shorten the connecting bar, the flat metal shaft which locates into the back of the latch. This is what the key turns to open the door. The length needs to be trimmed to accommodate the different thickness of doors. You need to make yours the same as the one you have taken off. With some pliers and some mole grips carefully snap off the right amount. The shaft has a series of score marks which make snapping a piece off possible. If you have difficulty with this use a junior hacksaw to saw a piece off instead. When you put the latch back on it locates in to the retaining plate. 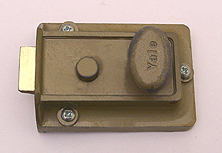 The flat metal shaft locates into a hole on the back of the latch.